Starting in north China's Inner Mongolia Autonomous Region, Zhang Jian wheels along the State Route 110, heading for Beijing. The biggest challenge for him was wheeling up and down slopes. A guidepost indicating a distance of 328 kilometers away from Beijing. 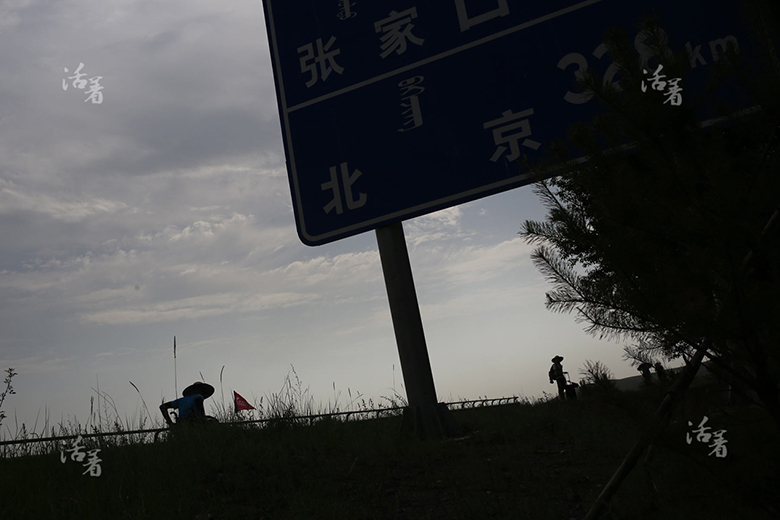 Zhang Jian takes photos with every guidepost he sees and uploads pictures to the Internet. 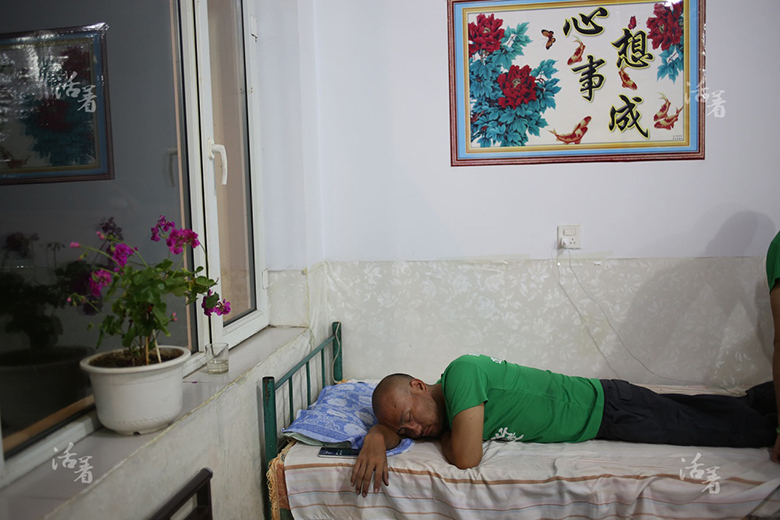 Zhang Jian, exhausted from the hike, falls asleep in seconds in this motel. Zhang Jian, joins kids playing basketball in front of the Grand Mosque in Hohhot, capital city of north China's Inner Mongolia Autonomous Region. Hikers shelter in a bus stop during a storm. Zhang Jian inching forward with two leaky wheels on the fifth day of hiking. Both wheels, without repair, are in need of pumping up every 15 minutes. A fellow hiker massages Zhang Jian's shoulders. All day long wheeling hurts his body. Zhang Jian phones his six-year-old child every day, telling the kid "to watch less TV and be good." 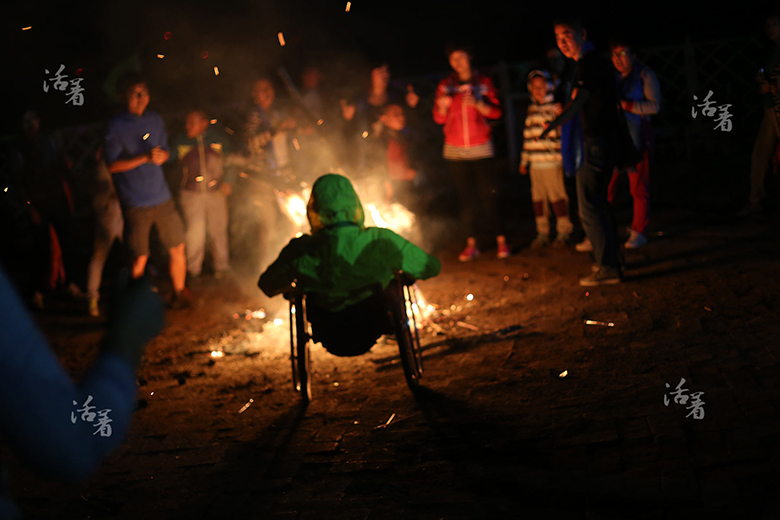 Zhang Jian joins a camp-fire party and dances with the music. All photos are courtesy of qq.com. 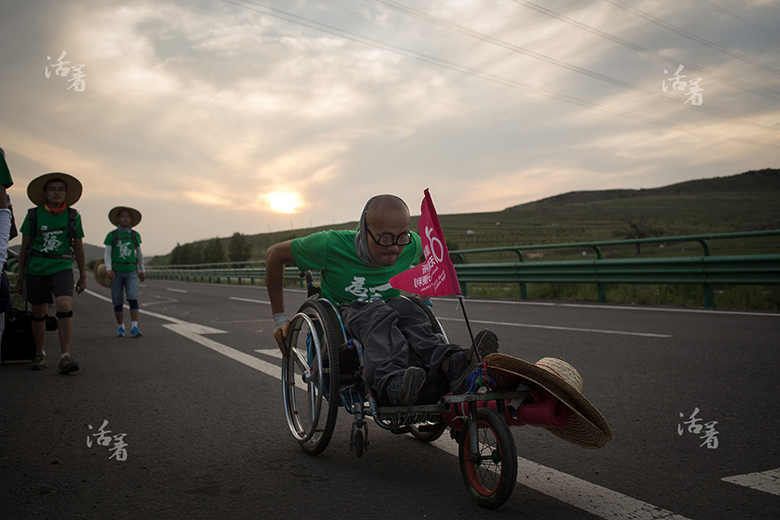 Zhang Jian, in his wheelchair, accomplished a 500-km journey from north China's Inner Mongolia Autonomous Region to Beijing from July 12 to 29. Starting in Ulanqab, a city located near the center of Inner Mongolia Autonomous Region, Zhang wheeled along the State Route 110, heading for Beijing. With the help of fellow hikers, Zhang overcame many difficulties, including steep slopes, storms and leaky wheels, but still accomplished the journey in just 18 days. 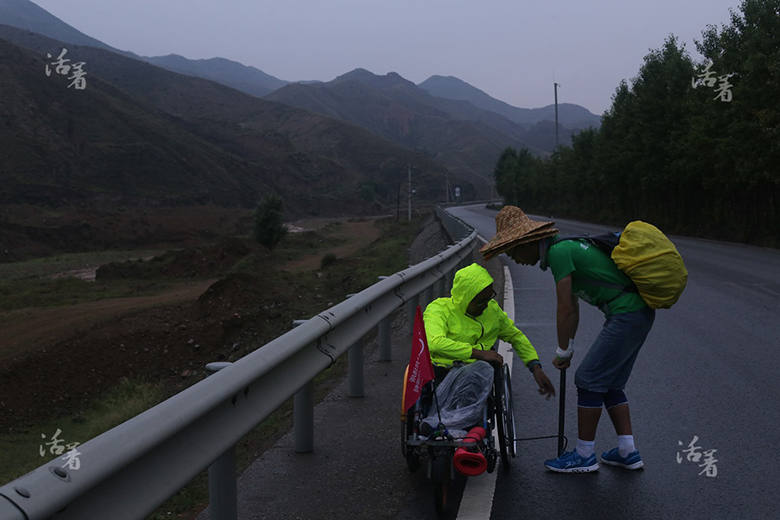 Zhang hopes that his hike will awaken the public to the concept of 'barrier-free traveling' and the need of free access for disabled people. Born in east China's Shandong Province in 1981, Zhang did not receive the polio vaccine when he was an infant and later diagnosed with poliomyelitis. Zhang's family, although poor, never gives up in seeking treatment for him. And Zhang, after two years of acupuncture therapy and three major operations, now manages to 'walk' somewhat, by squatting down and moving forward with both his hands supporting the body. Zhang's father encourages him to interact with healthy people and to not be discouraged. Zhang credits love from his family as the source of his empowerment. Zhang's life was greatly changed when he began playing wheelchair basketball in Guangzhou, capital city of south China's Guangdong Province. 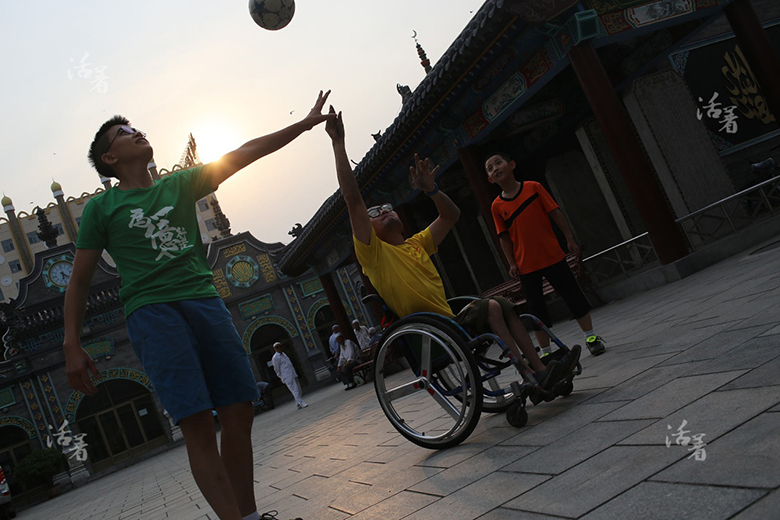 Zhang's long arms are an asset for playing wheelchair basketball, and he enjoys other sports as well. 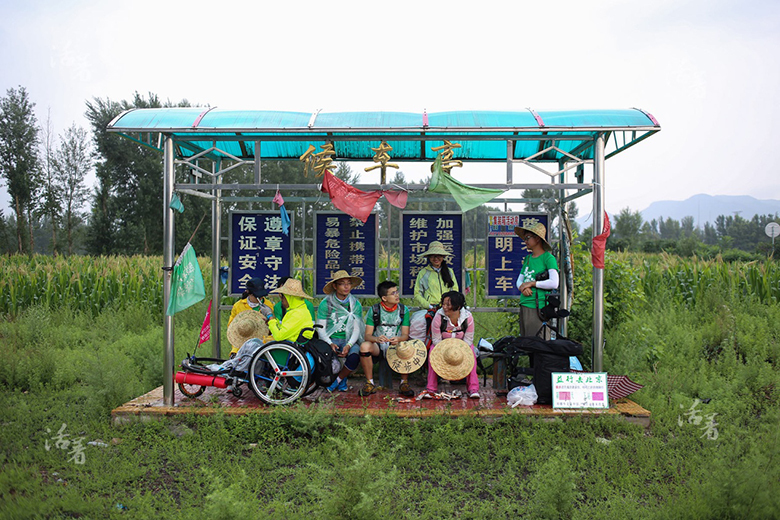 While various hi-tech sport wheelchairs would open additional doors for Zhang, as sport wheelchairs are far beyond his budget limits, Zhang has learned to retrofit wheelchairs for different purposes, including the wheelchair used in his hike. Being thoroughly familiar with wheelchairs, Zhang is often called "Mr. Wheelchair" by those who know him best.